Based on the carbon isotope ratios, it appears that Australopithecus bahrelghazali was focusing its noshing on a special category of plants that includes tropical grasses and sedges. These grassland plants have a distinct carbon signature in an animal’s teeth. 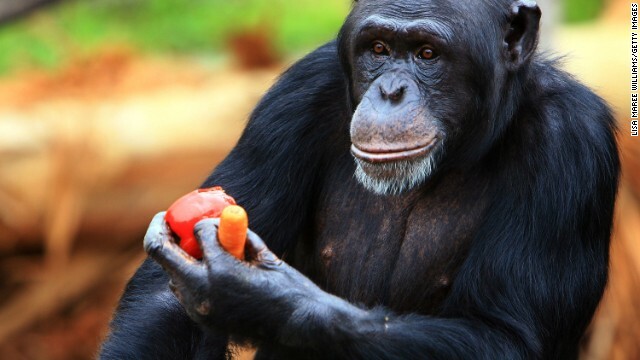 Apes, on the other hand, such as chimpanzees, do not eat that stuff, said Mark Teaford, co-editor of the Journal of Human Evolution and professor at High Point University, who was not involved in the study. Although primates have a wide range of plant foods in their diet, their meals broadly fall into the category of leaves, fruits and nuts – in other words, more “woody” plants. Considering the similar anatomy of early humans to other primates, Teaford says it doesn’t necessarily follow that they would be eating a lot of grasses and sedges. “To be able to look at the isotope work and say, this thing is eating a diet fairly similar to some more recent ones, it’s surprising,” Teaford said. Australopithecus bahrelghazali is the earliest example of a human ancestor who may have been eating grasses and sedges, and it’s more than 1.5 million years older than a previously-identified example of a hominin with this diet. Teaford, independent of this new study, does work on the microscopic wear on the teeth of ancient human ancestors. There’s evidence in that line of research also that the diet of our early humans was not quite like that of other primates such as chimpanzees and baboons. It’s possible that these results reflect, instead, that human ancestors were eating animals that were eating grasses and sedges. However, Teaford said that based on the strength of the carbon isotope signal from the fossils, it is probably not based on this indirect consumption of the plants. Also, different kinds of teeth probably would have been required to cut up tough meat. More research should be done to firm up these theories, however. This study is only based on two individuals, and the researchers could only investigate what these early humans ate during the time period when their teeth were forming – i.e. when they were young, notes Peter Ungar, anthropologist at the University of Arkansas who co-authored a book on the human diet with Teaford. But the results are interesting, and shows that our puzzle of the food choices of early hominids gets more complicated as we add pieces to it, he said. “I think it’s a wake up call to say, how well do we know what our ancestors were eating and how do we know what’s required to be able to eat these foods?” Teaford said. The new food pyramid provides a handy way to make sure your family gets the nutrition they need, no matter the pace of life. Let’s take a look at how easy it can be to ensure good nutrition. The food pyramid is divided into five major categories: grains, fruits, vegetables, dairy products and meats. We’ll offer suggestions on working these essentials into the daily fare with nary a complaint.-. All real evolution in nature is within limits. The genes already exist for micro-evolution (variations within a biological kind such as varieties of dogs, cats, horses, cows, etc. ), but not for macro-evolution (variations across biological kinds such as from sea sponge to human). The unthinking environment has no ability to design or program entirely new genes. Only variations of already existing genes and traits are possible. A dog will always be a dog no matter how many varieties come into being. Evolutionists hope and assume that, over millions of years, random mutations (accidental changes) in the genetic code caused by radiation from the environment will produce entirely new genes for entirely new traits in species so that macro-evolution occurs. It’s much like hoping that, if given enough time, randomly changing the sequence of letters in a cook book will turn the book into a romance novel, or a book on astronomy! Another problem for macro-evolution is the issue of survival of the fittest. How can a partially evolved species be fit for survival? A partially evolved trait or organ that is not complete and fully functioning from the start will be a liability to a species, not a survival asset. Plants and animals in the process of macro-evolution would be unfit for survival. Imagine an evolving fish having part fins and part feet, with the fins evolving into feet. Where’s the survival advantage? It can't use either fins or feet efficiently. These fish exist only on automobile bumper stickers! In fact, how could species have survived at all while their vital organs were supposedly evolving? Survival of the fittest (aka natural selection) may explain how species survive, due to minor variations and adaptations to the environment, but not how they originated. Natural selection merely “selects” from biological variations that are possible. It’s not a creative force. Genetic and biological similarities between species are no proof of common ancestry. Such similarities are better and more logically explained due to a common Genetic Engineer or Designer (yes, God) who designed similar functions for similar purposes in various species. Genetic information, like other forms of information, cannot arise by chance, so it's more rational to believe that DNA or genetic similarities between species are due to intelligent design. What about "Junk" DNA? The latest science shows that "Junk DNA" isn't junk after all! It's we who were ignorant of how useful these segments of DNA really are. Recent scientific research published in scientific journals such as Nature and RNA has revealed that the "non-coding" segments of DNA are essential in regulating gene expression (i.e. how, when, and where genes are expressed in the body). All the fossils that have been used to support human evolution have ultimately been found to be either hoaxes, non-human, or human, but not human and non-human. All species in the fossil record and living are complete, fully-formed, and fully functional. There's no macro-evolution in nature. *I have given successful lectures (with question and answer period afterwards) defending creation before evolutionist science faculty and students at various colleges and universities. I've been privileged to be recognized in the 24th edition of Marquis "Who's Who in The East" for my writings on religion and science. That is so true. I fell bad for those who don't believe, they'll have to find out the hard way. Don't you think humans would be a little overpowered with all those traits? Plus, we have our brains. We don't need super eyesight, we can make binoculars. We don't need super speed, we have cars and jets and boats. Heck, We can even go into space!!! Not to far from Chad in Gabon Africa human were using Atomic power plant two billion years ago . ,,same as we are today. Evolution is the survival of the fittest...... Who gave us our emotions and tears? We cry when we are sad....WHY? We laugh when we are happy and hear something funny....WHY? We see in color....WHY? We can show and feel love....WHY? We don't NEED those things for survival...... What about our conscience?? We don't NEED that either...... Lets also look away from us humans...and away from our planet earth wich is a testimony in itself....raise your eyes high up and see the stars and the universe itself. WOW, how AWESOME it is. All these things are a gift from someone who loves us wery much. Jehovah God, the Creator of the universe and everything that is in excistence. Oh, you poor little girl... Evolution is NOT the survival of the fittest. Evolution is the gradual change of (something) over time. Survival of the fittest is a catch phrase. Other than that, you ask a lot of questions, and the only answer you provide is "goddunnit". You seem to be under the impression that we are the only creatures who see in colour... that is demonstrably false... open a biology text book and learn of the other species who see in colour. To show the ignorance of your reasoning... your bible claims god made man in his own image, therefore, we are nearly god like... why then did he create humans with worse eyesight than the octopus? than the eagle? why did he make us slower than the cheetah? why did he make us weaker than the chimpanzee? Why did he give dogs a better sense of smell? why did he give bats echo location and not us? For that matter, who made god? Where does god live? Which account of Jesus' birth is correct, Matthew or Luke? Your god doesn't answer any questions... evolution does. All you have to do is read a science text book... if you don't understand, you ask a science teacher to explain it to you. Apes ate fried chicken, watermelon, and sweet potato pie! All charged up on their EBTs! That is why he is holding an obamaphone in his right hand. Well, you mean a Reaganphone, the free phone program was started by in 1984 with free land line service. I cannot believe either of you cannot be reported. Nice racism dudes. How's that thought process workin out for ya? Again, why can't they be reported? This whole subject is hilarious. It has no impact on anything, yet people become angry or demeaning or so passionate. Its like sports betting sheets. For entertainment purposes only. I would argue that it is important, because we can figure out what foods are bodies are naturally designed for. The processed foods we eat to today make us sick. If we discover that humans evolved on fruit, leaves, nuts, and raw meat then we know what diet is healthiest for us today and what we should eat for maximum health and minimum sickness. Wow ok evolution is not a matter of opinion. If you don't know about science what gives you the idea your rebuttle against scientific evidence is worth anything? It's like having a infant teach you to play piano. I read recently that only in the USA do educated people give at least lip service to the validity of a Genesis myth. In my own view, the miracle is not did it take 6 days or 6 billion years, but that it happened at all! If it tool 2 weeks instead of 1, would it be only half as miraculous? The word miraculous implies a magic power... magic does not exist... Harry Potter isn't real. Yup....certainly not related to dogs, cats or cows. No! Humans are primates. Apes are primates. Humans are not Apes. Caribou are deer. Moose are deer. Caribou are not moose. Get it? Yes, humans are not considered to be apes by current scientific thinking, but I think that point can be argued. Fritz, that was great, and probably right on track! Good job! and thanks! We are primates and we've never separated ourselves from them. We just do things a little differently. We are them and they are us, in short. It's that simple. Is that an Obama phone he is holding in his right hand? It's always hilarious watching religious people argue against things they don't understand at all. To be religious is to be wilfully stupid. Check your straps, I think that tinfoil hat must be coming loose. There is no genius but Christ. Praise be his name!!!!!! I believe differently...My faith tells me that Oingo-Boingo created the earth in 1 day from elephant guts and all the gut bugs became the first people. The h*ll with all the scientists and their "theories". "our close primate relatives". I'm insulted and shake my head in disbelief. You so-called scientists should be wearing a different kind of white jacket – a strait jacket! You can call YOUR relatives apes and monkeys, but my ancestors were born human from Day 1 to present! These people don't believe evolution. It is just a theory, after all. The bigger question is this – Why do people who purposefully choose to be ignorant about science, come onto science threads and post inane religious drivel demonstrating that ignorance for all to see? Monkeys r funny. He thinks we didnt come from monkeys!! Funny funny funny. We are them and they are us. Face the facts and move forward. He's insulted. Really? Reality insults you? The war is over dude...even the Catholic Church gave up fighting this battle. COULD IT BE THE COMMON LINK IS THE CREATOR? OR ADMITTING THIS YOU WOULD HAVE TO ADMIT YOU NEED A SAVIOR! "COULD IT BE THE COMMON LINK IS THE CREATOR?" No. You are funny. I love it when grown ups believe in a "creator". "He sees you when you're sleeping. He knows when you're awake. He knows if you've been bad or good. But if you kill someone, he won't do anything about it, even though he is all powerful and real." OMGoodness, that is funny and SO TRUE. I, myself would rather believe in Santa Clause...he is much nicer and only comes around once a year...and he MUST be real cause Norad tracks him every year! They don't do that for the "other guy in the sky". Evolution is fact. There was no Adam and no Eve. No talking snake. No original sin. No need for salvation and no need for a savior. If you don't take Genesis literally the whole story is allegory. Wow. For an agnostic, you seem to know a lot about the Bible. It's amazing when people acknowledge something that doesn't exist, but yet it does. Something has to exist in order to be denied! Think about it. Really, so all I have to do is deny something and that means it exists? I deny unicorns. Dolt! I deny that I want to win the 500 million dollar lottery.....wait...wait....crap it didn't work! Monkeys and humans are differant species no matter how many billion years you go each way, why else would you still have monkeys and humans. why wouldnt all evolve? No wander they have differant diets! So we are clear, the animal in the photo is a chimpanzee, not a monkey. But monkeys, humans, and chimpanzees are indeed different species, but share a relatively recent common ancestor. Monkeys and chimps are not "less evolved" than humans, they simply took different evolutionary pathways away from the common ancestor. "Still have monkeys" is the wrong verbiage. The reason that there are monkeys and humans at the same time is the same reason that you have/had a grandpa but also have a cousin. We share a common ancestor with monkeys and fish and all other living organisms...even plants. However, chimps are our closest living relative that is a different species. say what? lol. I hope you don't go out in public saying that! People will laugh you out of the building. They would laugh me out of your building...church. Common ancestry is proven with genetics alone. So without a single fossil, evolution is a fact. I think you are a troll because you make silly claims and back them up with nothing. "Also, different kinds of teeth probably would have been required to cut up tough meat." So the latest paleolithic fad diet is BS. More grains less meat. Sounds like the new food pyramid. One of the most important parts of the Paleo diet is to not eat chemicals, preservatives, prepared food that has been "improved", mystery food, dairy products and fake sugars. Good food is expensive in the short run and a screaming deal in the long run. in a million years from now, if we're not extinct yet, someone will find fossilized remains of a human teenager oddball who liked to eat glue, and come up with all kinds of theories based on ONE fossil. Actually one of the smartest things said yet! We assume the "one" sample is the accepted norm and never take the one-off into consideration. How many folks these days are little people or those with giantism. Or some orher difference? Well now, humans were never apes, apes will never be human! Evolution is a "theory." The so called "missing link" between the humans and apes hasn't been found, and never will be! When someone gets hungry, if at all possible, they eat! Simple as that. How much does this scientist make yearly for studying teeth? Better still, who gives a flip about what someone was eating 6000 years ago!?! Try millions of years ago...not six thousand. Get your nose out of that book and join the modern people. Saying it's ok to reject evolution because it's "just a theory" shows you don't know the various meanings of the word "theory". English is like that - lots of words have somewhat different meanings in different contexts. A scientific :"theory" is not unproven. It's proof lies in how well it explains observable stuff and predicts useful new underrstandings and results. For instance, the theory of evolution implied that there had to be some universal life thingy, and intrigued scientists hunted it down, eventually finding it and calling it DNA. The discovery and study of DNA is a solid result of the theory of evolution that proves evolution. It's widely accepted as a crime-solving tool by people who don't realize the evolution connection. Scientists are using DNA to study a lot more than criminal idenity; It shows for instance that we are not descended from any existing apes,but from a common being (now extinct) that evolved in different way into chimpanzees and humans. Chimps can't become human now - it doesn't work that way. But we had a common ancestor way back that was neither chimp nor human. This was a brilliant insight based on indirect evidence by early evolutionary scientists. It is now demonstrable. You don't have to be brilliant to see it now. In fact, you have to be willfully blind not to see it. It is not optional. Thank you, Susan, VERY well put! Humans are apes. We are great apes. Your post is an exellent example of what happens when you choose to get your "sciency" information from the "Pastor Dave's" of the world. The problem is that "Pastor Dave" is just as ignorant about sciece as his minions. Since the study was based on two individuals when their teeth were forming, it can't consider other possiblities for a 'woody' diet such as drought or other crisis that led to that being the only food available. More and varied study is needed but understandably there is a lack fossil evidence to study. first of all humans aren't picky eaters. what is out there that a human hasnt tried to eat? (other than feces and urine, which has been done). Maybe where your from you only eat what YOU WANT but I consider all options when hungry, and then pick the best. Its called choosing your best options....NOT PICKY. If I had to drink my own urine or eat wild meat to survive I would. Just like any HUMAN. It annoys me how the generations are turning immature and unwilling unless its THEIR way. We only eat around 15% of the worl's food sources. God planted these bones to fool non-believers. Why would God provide significant evidence contrary to the Bible and even his own existence? In what possible context does that make sense? That is so true. I fell bad for those who don't believe, they'll have to find out the hard way. Hope your "theory" can help you where your going. Go put your head back in the sand. I believe in supreme because my parents taught me. But When I got educated my thinking changed. There is no proof that God created universe in 7 days. But there are many proofs scientifically available that humans evolved from common ancester. From common ancester many different species evolved such as humans,apes,chimps etc. Apes chimp can not be evolved into humans now because they evolved that way from the common ancester. Please give me solid proof contrarary to my belief. Thank you. just open your heart and soul, not your mind! Please tell me you are not serious, open your heart and not your mind! That is the problem with the world...closed minds. SO MANY people would be alive and happy if others would just open their minds!!! open heart too but OPEN THAT MIND!!! open open open! I have a question. How did the big bang start? I don't think space randomly explodes. Plus, if you read a Bible, you'll get all the proof you need. Humans learded to cook thier food , domesticate animals, and plant gardens, where as Neanderthals hunted meat. ... which is about as relevant as invention of cellphones would be for an article about building of pyramids. Domestication of animals and beginning of agriculture: somewhere between 10 and 20 thousands years ago. Extinction of Neandertals: about 30 thousands. Beginning of cooking – well before that, and Neandertals definitely did cook food. Anything discussed in this article: >3 millions, i.e. 3000 thousands. Or it could be that early humans were smart enough to try different foods, when faced with the alternative of starving to death.